Today’s post is not really a recipe as much as it is a method. A “how-to” if you will. We’re talking about how to roast spaghetti squash in the oven! Spaghetti squash is a fall and winter staple in my house. Especially for those who can’t eat pasta or are watching their carb intake.. spaghetti squash a great way to have an easy and delicious “pasta-like” meal! So what is spaghetti squash exactly? Well… it’s a squash, that looks like spaghetti. Very scientific explanation right there I know. But that’s all I have for you on that matter. I CAN however, tell you what it tastes like. It doesn’t really taste like spaghetti, but instead a slightly sweet squash. It’s very mild in flavor which mean’s its a great vehicle for different sauces without being too overwhelming. 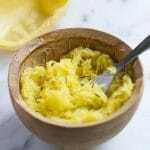 My favorite way to eat spaghetti squash is just as you would eat spaghetti! With some meat sauce, some homemade pesto or just plain with some fresh herbs, salt and pepper! Yum! The easiest way to cook this versatile veggie is in the oven and I’m going to show you how… STEP BY STEP! I’m normally not a step-by-step person, mostly because I forget to take pictures while I’m cooking. But, in instances like this, I think it’s really helpful to go step-by-step! So here we go! Now, you’re going to take your spaghetti squash and with a large chef’s knife, cut it vertically right down the middle from stem to tail. Now, this is going to be a little tough to do.. so cut it slowly. With a spoon, scoop out the seeds from the middle of the squash. You don’t want to spoon into the actual flesh, but just get all the seeds and stringy bits out. Drizzle the insides of the squash with a little olive oil and place the squash flesh side down in a 9×13 inch baking pan. Bake at 400F for 30 to 45 minutes, until the flesh is tender. If the squash is still a little hard, put it back in the oven for another 5-10 minutes. With a fork, begin scraping the inside of the squash, separating the flesh into spaghetti-like strands. Continue scraping until all of the flesh is scraped into long noodles. Serve immediately with a little butter, salt and fresh herbs! Roasting spaghetti squash cannot be easier! With this simple method you can use spgahetti squash in a variety of ways to make healthy and delicious meals. Naturally gluten-free. First preheat your oven to 400F. Now you're going to take your spaghetti squash and with a large chef's knife, cut it vertically right down the middle from stem to tail. Now, this is going to be a little tough to do.. so cut it slowly. With a spoon scoop out the seeds from the middle of the squash. You don't want to spoon into the actual flesh but just get all the seeds and stringy bits out. Drizzle the insides of the squash with a little olive oil and place the squash flesh side down in a 9x13 inch baking pan. Bake at 400F for 30 to 45 minutes until the flesh is tender. If the squash is still a little hard, put it back in the oven for another 5-10 minutes. With a fork begin scraping the inside of the squash, separating the flesh into spaghetti-like strands. Serve immediately with a little butter salt and fresh herbs! I’m a huge fan of spaghetti squash! Love these easy step by steps for making it. I love spaghetti squash! Love this bright photo how-to!